It's a bit early for Halloween but I was building this little beauty today and couldn't resist sharing! 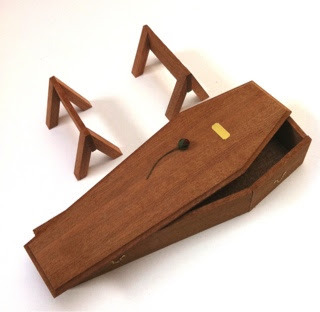 The coffin comes in kit form, is made in the UK and is produced in real, unfinished mahogany ready to be varnished and polished up to your hearts desire. All the little brass fittings come with it too. Maybe a little sinister, but I LOVE it! Enter CUPCAKE12 at the checkout.